The Fulltone OCD pedal can be seen in the top row, third from the right, on Jonny's pedalboard. As a means to verify that this is Jonny's board, [here](http://images.equipboard.com/uploads/source/image/5222/big_2041.jpg) is another picture of it after a concert, covered in butterfly confetti. There are plenty of pictures of Coldplay covered in this confetti from stage during their 2012 tour, such as [this one](http://www.coldplay.com/livetransmissions/288_med_20120805000933.jpg). Jamie Cook's Fulltone OCD Obsessive Compulsive Drive Overdrive pedal can be seen on the bottom row of his pedalboard in this photo. "The OCD seems to work very well," says Joe Perry's guitar tech. 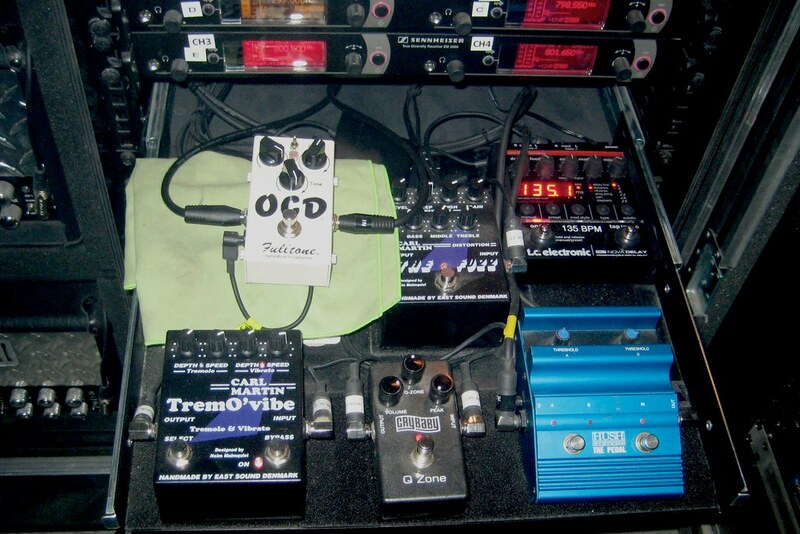 Joey Santiago uses Fulltone OCD Pedal in his pedalboard during the Pixies performance. The Fulltone website lists the OCD as one of Eric Johnson's pedals. Keith Urban uses a pair of Fulltone OCDs, as can be seen in this photo of his gear rig. Photo was originally sourced from Keith Urban's artist page on [Fulltone's website](https://www.fulltone.com/artists/keith-urban). James Valentines Fulltone OCD Obsessive Compulsive Drive Overdrive Guitar Effects Pedal can be seen at 16:51 in this Rig Rundown. He says: > The Fulltone OCD is my main lead sound, it's awesome. At the 4:40 mark in Brendan Benson's rig rundown, his Fulltone OCD pedal is visible as the camera pans over his pedals. Current pedalboards for Jordan Lawlor of M83. Top 2 rows are for guitar and bottom row is for bass. 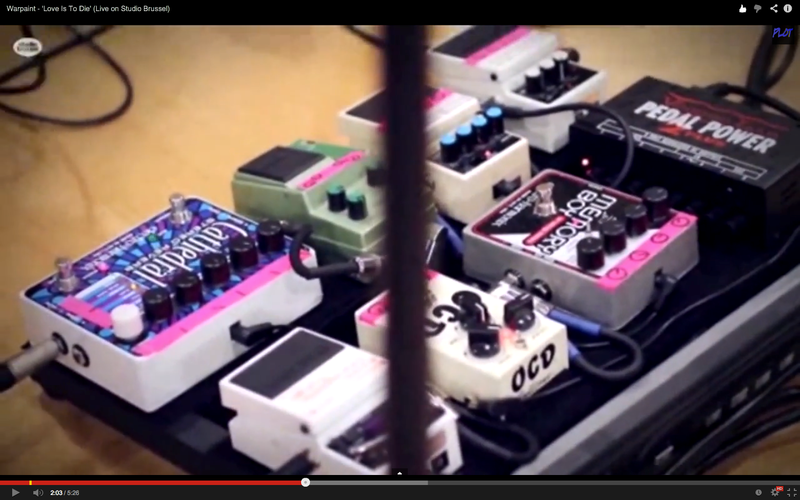 The fourth pedal in the chain on Ryan Jarman's pedalboard is Fulltone OCD drive pedal. This photo was posted by Ryan on his Twitter account in Nov 2012. He says, "Mars bar party on my pedal board"
Pausando este video de 2016 aos 2:34, é possivel ver o pedal OCD em seu pedalboard. You can see the OCD in the third image between the Plus Sustain pedal and the EHX POG. He uses this pedal, according to his Instagram photo. It is uncertain if guitar is Fender Telecaster. "But also, I love the Fulltone OCD, which is always in here, too." - Frampton about Fulltone OCD at 51:35 minute mark. "I play jazz licks once in a while. So I want those to be pretty clean. And then I've got an OCD that overdrives and cleans just a little bit. And I’ve got the two Roland Blues Drivers that I absolutely love. And a wah pedal, and that's it." According to Tweet from Toro, he uses the Fulltone OCD pedal in his pedalboard. Clearly visible at the top of the board. From Tone King video, explaining his effects setup, with Jeordie and his guitar tech, as a live guitarist instead of bassist (in live settings) for Marilyn Manson. "The bass board comprises various gains such as the [Aguilar Agro](http://equipboard.com/items/aguilar-agro-bass-overdrive) and an OCD Overdrive, along with an [Aguilar Octamizer](http://equipboard.com/items/aguilar-octamizer-bass-octave-effect-pedal) for subs." - [*Mix Online*](http://www.mixonline.com/news/tours/all-access-onerepublic/368344). 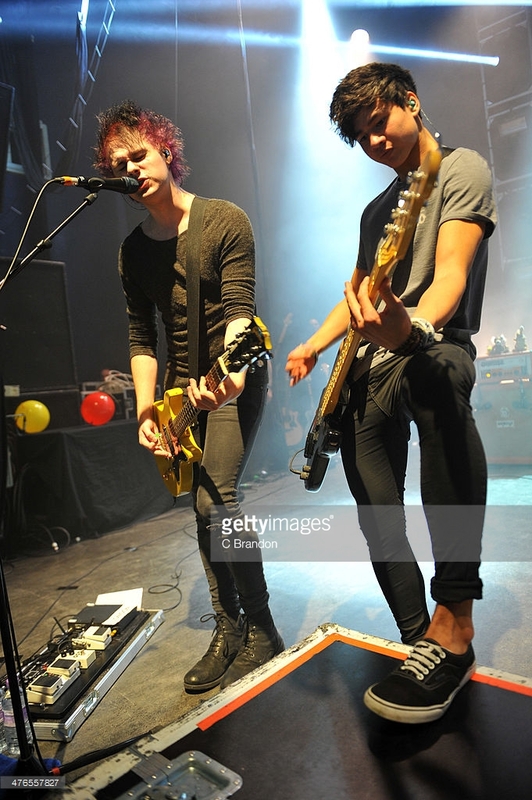 In this photo, you can see that Michael is using an OCD pedal. In this 4 pedal setup by shriner, Fulltone OCD pedal can be visible. Pablo muestra su 'Rack' y se puede apreciar en la parte superior al Fulltone OCD. The 2nd pedal in Brian Fallon's simple pedalboard setup, after his Jim Dunlop British Invasion Wah, is the Fulltone OCD Obsessive Compulsive Drive Overdrive Guitar Effects Pedal, which his guitar tech says is set to a "really, really minimal drive to it, you can see it's just barely set, and that's just a little bit more drive." (19:29 into this rig rundown video). In this pedalboard photo posted by On on his Instagram account, one of the pedals on the board is the Fulltone OCD overdrive pedal. In these photos, Lincoln's board has a Fulltone Soul Bender, Full Drive 2, OCD, Supa-Trem, Clyde Wah, a Line 6 DL4, a Boss TU-2 and an NS-2, an Ernie Ball Volume pedal, and a Vox channel switcher. In this Picture, you can see the OCD Fulltone on his pedalboard at bottom. At 0:19, his pedals can be seen. There's an OCD pedal in the top middle. 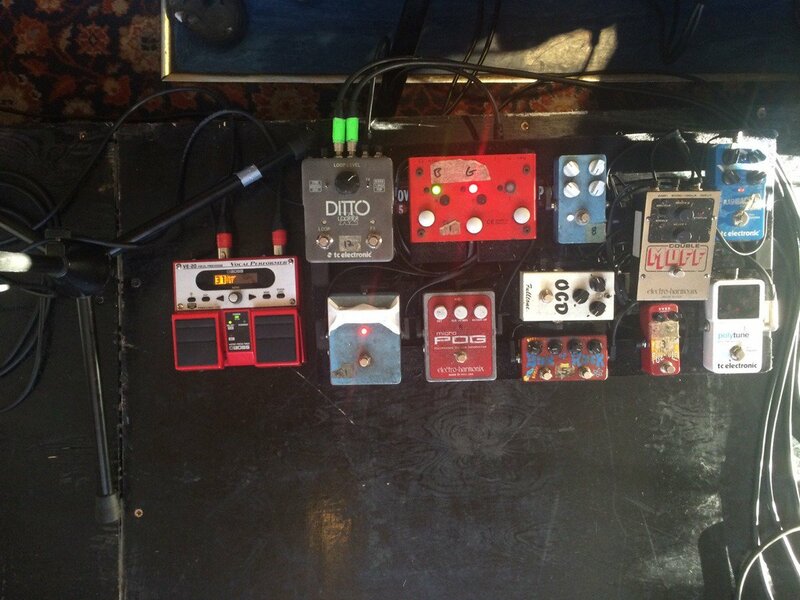 At 6:36 you get a very good look at Broemel's pedal board, and the OCD can't be missed. On Don Felder's website, he confirms his use of Fulltone's OCD overdrive pedal in [this Q & A](http://www.felderfans.com/guitar-q-a-with-don/3/): "'What specific pedals do you use for the effects on One of These Nights and Hotel California?' 'For 'Hotel' on stage I use a Boss stereo chorus, Boss echo and an OCD overdrive pedal on the six string neck. I use a boss echo and a leslie for the 12 string neck. The guitar is custom-wired with two output jacks so that when I switch necks it switches outputs to different amps.'" In this photo, which shows Howe's effects, one of the pedals that can be seen is the Fulltone OCD pedal. According to the Fulltone website, Al Di Meola uses their OCD pedal. The Fulltone OCD model pedal can be seen clearly in the bottom left of this picture posted to his band's official Instagram Page. 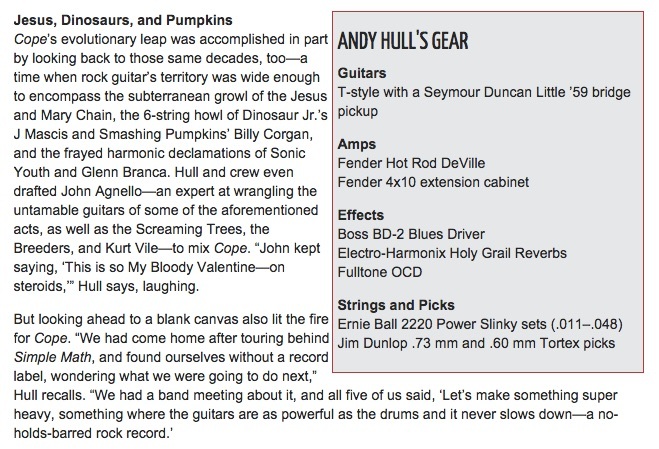 Andy Hull uses a Fulltone OCD effects pedal according to [this article from *Premier Guitar*](http://www.premierguitar.com/articles/20579-manchester-orchestra-sharing-a-lung). In this video from October 2011, Ryan can be seen with a OCD Overdrive. It's shown at 1:56. Used during the recording of Dinoasur Jr.'s *Farm*. Visible at 19:36. 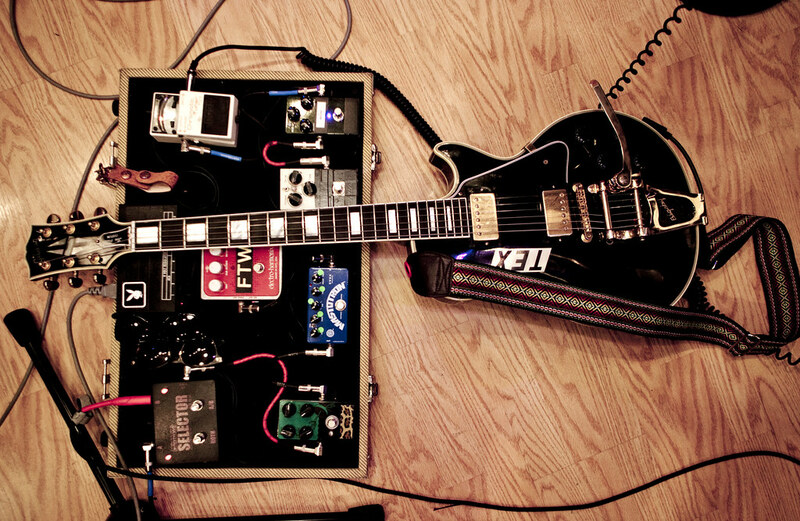 In this photo, Wargo reveals his setup, which has the Fulltone OCD Overdrive pedal. "For the last few years I used a Fulltone OCD, but now I use the Fuzzorcious Oh See Demon, which I find more to my liking." 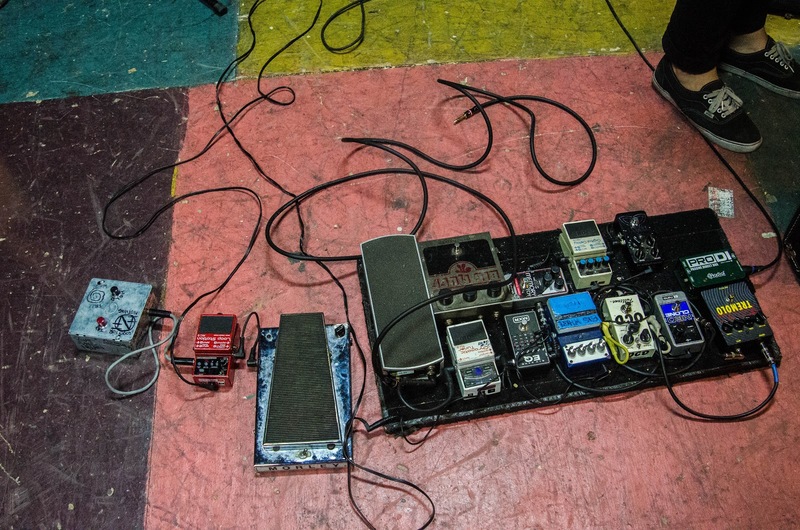 In this photo, found in [this article](http://www.leftlion.co.uk/articles.cfm/title/live--russian-circles-and-earthless/id/2906), Mike Sullivan from Russian Circles is scene with his pedalboard, which includes a Fulltone OCD. On the ESP Guitars page, you see a picture of Lars on stage live with a Fulltone OCD pedal. In an article for Vintage Guitar Magazine in September 2010, Steve states he uses a Fulltone OCD Pedal: "Then, for guitar there’s a Klon Centaur I use for the Gibson guitars, a Fulltone OCD for Stratocasters – it’s weird, but they always sound different in each venue; sometimes I switch guitar setups and one just feels better than the other." In [this interview](http://www.guitarplayer.com/artists/1013/robin-trowers-moody-blues/23663) with Guitar Player, Robin Trower says "The OCD had a good distortion but was a little trashy sounding, whereas the original FullDrive is very expensive sounding. But the FullDrive had a germanium chip that is hard to find and unreliable in heat and cold. We combined the OCD’s distortion with the original FullDrive’s rich tone." in this image , Fulltone OCD pedal can be seen. For Marsden, his desert-island effect has to be an Ernie Ball VP Jr Volume Pedal because he says it’s the most expressive tool under his control. When it comes to actual noisemakers on his board, he has a Fulltone OCD, an Electro-Harmonix Big Muff, Electro-Harmonix POG2, a Strymon El Capistan, a Boss DD-7 Digital Delay, an Electro-Harmonix Bass Soul Food that he sniped from bandmate Emma Richardson, an EHX Cathedral, and a Danelectro Reel Echo. Everything is controlled by GigRig QuarterMaster QMX8 switcher and it all stays in tune thanks to a Boss TU-3 Tuner. A rather modest pedalboard sits at Caws’ feet and contains a Boss TU-3 Chromatic Tuner, Fulltone OCD, and a DLS Effects RotoSIM. The homemade pedal is a Klon clone that was built by John Bednar of Clifton, New Jersey. And that thing he's touching is an OCD overdrive pedal. Look carefully, It's hard to see. "Utility distortion pedal. Replaced my high school era Boss Orange Distortion years ago." This Premier Guitar article shows a photo of and describes Tom Keeley's gear, which includes the Fulltone OCD distortion pedal. According to his pedalboard photo, he also has Fulltone OCD. Very faint in the picture, but it's on the right side of his board. According to Premier Guitar, Triplett uses the Fulltone OCD Overdrive pedal. In this Instagram photo posted by Veruca Salt, Gordon's band, her pedalboard is visible. Among the pedals, one of them that can be seen is the Fulltone OCD drive pedal. According to the Premier Guitar's interview, Hatfield uses the Fulltone OCD drive pedal. this pedal can be seen on this pedalboard, it's the withe one with the black tape on the right between Mastotron and Carbon Copy. Lee Malia's Fulltone OCD pedal can be seen on his pedal board at 20:30 in this video. in this image , Fulltone OCD can be seen. In the Instagram photo of Sam Bowden, next to an Ibanez TS808, you can see a Fulltone OCD pedal. Concert Photo from the Worcester Palladium. At 0:14, Eoin's board is shown, which has a Fulltone OCD Overdrive on it. "Within that system, I’ve got different options before the split. Some things can affect both amp signals, so there’s a Fulltone OCD which I have several different settings for, from a clean boost to a bluesy gain to aggressive mid-gain." Se can see on the photo, he use 2 distortions: Proco Rat and Fulltone OCD. At 20:30 in this video, Courtney Barnett is seen using her Fulltone OCD Pedal during her live gig at SXSW. "Here's a shot of Charlie Burchill's (of Simple Minds) studio rig... recording currently in the UK. Note the plethora of Fulltone pedals... an OCD, Supa-Trem, Tube Tape Echo, DéjaVibe2 and a Clyde wah." In photo provided by Tim Grime, we can see that Haug uses Fulltone OCD. At 5:15 Marcus Miller shows his Fulltone OCD Overdrive. According to the Premier Guitar's interview with Valerie June, her "gear list" also includes the Fulltone OCD overdrive pedal. 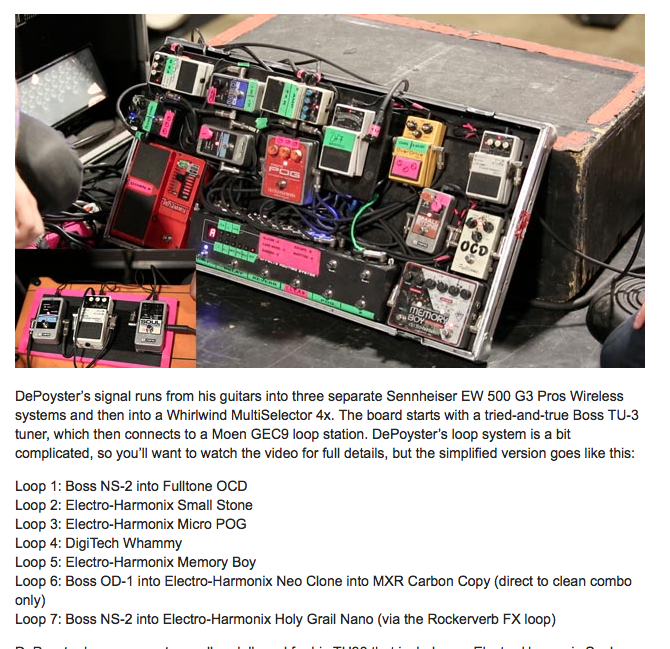 Jeremy DePoyster uses a Fulltone OCD pedal, according to [this](http://www.premierguitar.com/articles/20659-rig-rundown-the-devil-wears-prada) Premier Guitar rig rundown. 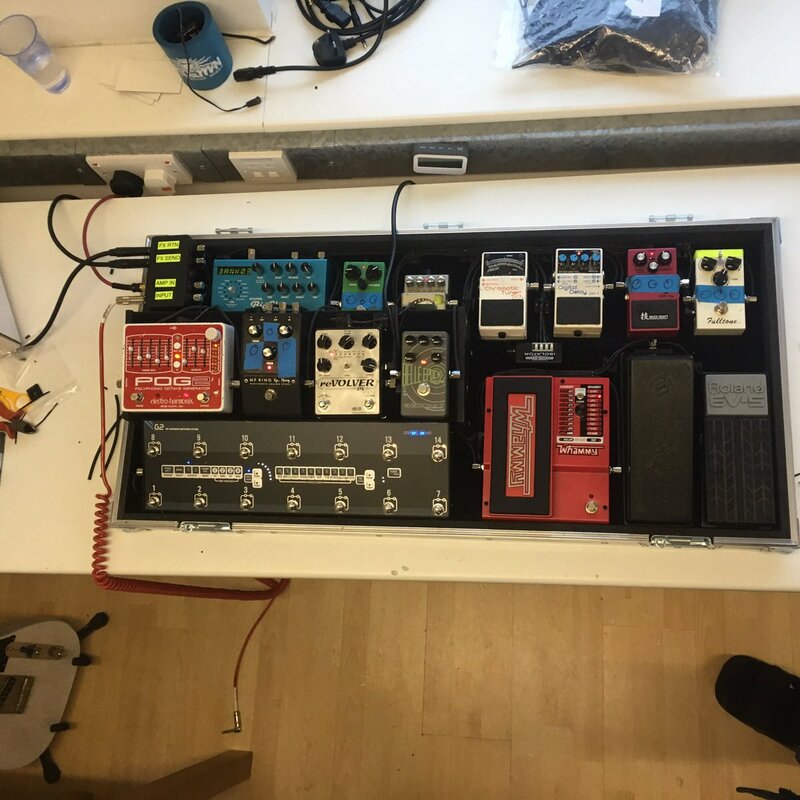 In this instagram post, Joseph Andreoli shares a birds eye view of his pedal board containing a Fulltone OCD Obsessive Compulsive Drive Overdrive on the bottom right. Shoegazing . Ensayos para el próximo show en Niceto, el sábado 8. In this photo of Payseur's pedal board you can see the Fulltone OCD. Just below the Giga Delay, Cody uses an OCD overdrive pedal by Fulltone. According to Premier Guitar, Rowsell uses the Fulltone OCD pedal. According to Guitar Geek's rig diagram, Wade uses the Fulltone OCD Guitar Effects Pedal. Mr. Nick Bockrath uses the Fulltone OCD Pedal on his pedalboard. 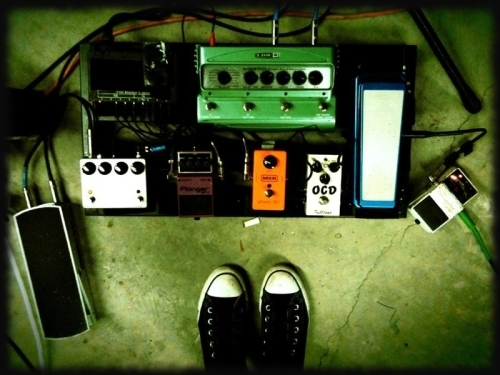 https://www.instagram.com/p/BgUYPO4F1r5/?taken-by=premierguitar The image of Marissa's Pedalboard posted on March 14th clearly shows a taped OCD-Pedal. The OCD pedal can be seen on his Pedaltrain in this video! According to this gear photo, which is found under [Denander's gear photos](https://tommydenander.se/photos/gear.html), one of the pedals is the Fulltone OCD overdrive pedal. This is my main overdrive pedal. It's more distortion I think but it's mega versatile and it's a little tank. At 14:33 you can get a glimpse at Dave's board during the recording of La Di Da Di. OCD is on the far right near the amp. “I usually play with a more elaborate rig, but for SXSW I only brought a few pedals and carried them around in my backpack all week. I wanted to keep setup time to a minimum and reduce the weight of my gear as much as possible, as I'm usually carrying it all on my back from venue to venue during SXSW.” - Torres about her pedalboard. YOU CAN SEE THE PEDAL NEXT TO THE GREEN RHINO ON HIS BOARD BEING CHECKED BY HIS ROADIE. IT SEANS TO BE REPLACING THE MXR MODIFIED OD. 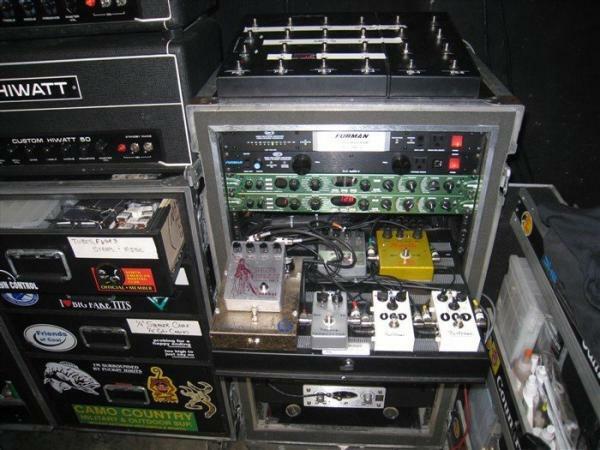 The Fulltone OCD has been a part of Wil's rig setup since the formation of The Smith Street Band. The pedal can be seen in this picture at the very bottom but the C and the D are clearly visible. In their Tumblr post, Brian states that he and Sean both use Fulltone OCD pedals. "I do play with like an OCD distortion [...]"
In this pedalboard photo taken by Hatherley on her Instagram profile, the Fulltone OCD pedal is visible. Shown on his pedalboard at roughly 30 seconds into video demo'ing custom wah pedal. From a Gear Gods interview in 2014. Can be seen pointing at it and saying: "This dude too, like I've seen it on so many boards. Shiv in Deafheaven uses it. It's such a versatile pedal." The OCD pedal is visible in the middle of his pedal board. 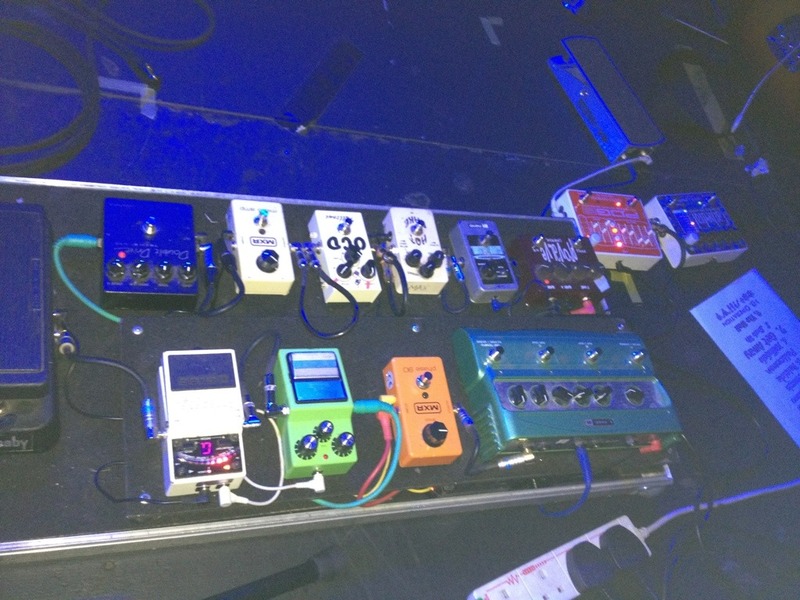 In this picture of Matt's board at a gig, he is seen to have a Fulltone OCD drive. 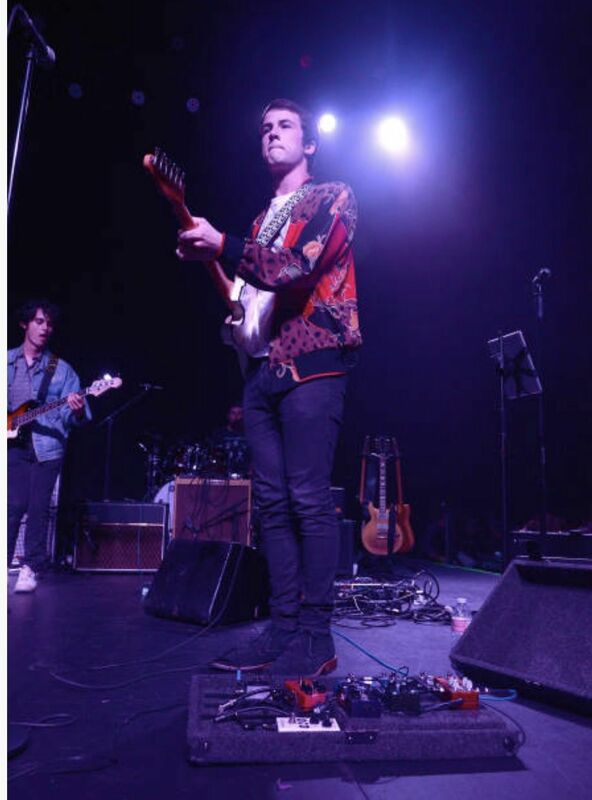 The handful of stomps that he relies on includes: Fulltone OCD, Fulltone Fat-Boost, Ernie Ball Volume Pedal, Boss TU-2 Chromatic Tuner, Fulltone Full-Drive 2, Pro Co RAT, Maxon Rotary Phaser, Dunlop Crybaby Wah, Line 6 Echo Park, TC Electronic G-Force. And for strings, picks, and accessories, he currently jams D'Addario EX115 (.010-.049), Rocktron MIDI Mate, Whirlwind Selector A/B, Sunrise acoustic pickup, K&K Pure Classic acoustic pickup, and Avalon U5. For guitarist, Nershi mainly uses a Collings I-35, a Santa Cruz D-Nershi Signature Model, a ’70s Martin D-28 ("FrankenMartin"), a 1955 Martin D-18, and a Ton Nershi T-Style Guitar. When it comes to amps, Nershi goes with his tried-and-true Fender formula involves a Blues Deluxe and a Blues DeVille. The handful of stomps that he relies on includes: Fulltone OCD, Fulltone Fat-Boost, Ernie Ball Volume Pedal, Boss TU-2 Chromatic Tuner, Fulltone Full-Drive 2, Pro Co RAT, Maxon Rotary Phaser, Dunlop Crybaby Wah, Line 6 Echo Park, TC Electronic G-Force. And for strings, picks, and accessories, he currently jams D'Addario EX115 (.010-.049), Rocktron MIDI Mate, Whirlwind Selector A/B, Sunrise acoustic pickup, K&K Pure Classic acoustic pickup, and Avalon U5. If you pause at 4:03 you can see that his pedalboard has a Fulltone OCD. In the images that accompany [the article](https://rocksubculture.com/2015/01/08/dave-wakelings-english-beat-new-album-for-crying-out-loud-coming-soon-2015-live-concert-dates-photos-preview/), you can determine which pedal board is Dave's and there's a clear shot of the pedalboard itself (from a performance by The English Beat at Ace of Spades in Sacramento on January 2, 2015). I asked her about her equipment after a show in NYC. I shoulda asked more she was super cool. > **Tell us about your pedals** > >My pedalboard is always in a state of flux, but currently I’m using an Ernie Ball volume pedal for swells and a simple Boss DD-3 for delay. I also have a Boss TR-2 Tremolo pedal and a Boss OC-3 Super Octave pedal, and a Fulltone OCD distortion pedal. For weird sounds, I’ll sometimes use my Electro- Harmonix Harmonic Octave Generator. > It has a way of bringing out the good qualities in an amp and it’s perfect for lead boosts. It trades places with an OCD ver.3 that I also picked out of a batch I was testing. "guitarristas, os pedales estan cableados en otro orde,hay un ruteo"
The pedal can be seen at 0:55. Facebook photo of Julien Baker's live pedalboard. It's one of his 14 pedals. Can be seen at 2:42 on Jako's desk. At 3:21, a shot of Javier's pedalboard for for his live Rig shows us the OCD to the left of his Jeykill and Hyde pedal. As of 11/16. Pedalboard stripped down. OCD replacing soul food and sl drive. In this photo of Barnes' pedal board, you can see his OCD pedal on the first row, 3rd towards the right. This is from a revern interview with Olsen about her effects. "In the past, I didn't think much about effects until I was in the studio. But being on tour for Burn Your Fire, I primarily used Holy Grail/OCD or Boss overdrive/distortion." You can see here his Fulltone OCD at the end of his mini pedalboard. This item can be seen at the bottom of the photo. Fulltone OCD pedal of Danny's. "The next stomp is a Fulltone OCD that he only uses when he runs into venues that have decibel limitations." This Instagram post shows Sam and his pedal board, where the Fulltone OCD pedal can be soon next to the Tube Screamer. At 13:41 an OCD pedal can be seen on her board. In march 2017 LeBlanc posted this photo on Instagram calling this his set up for the day. An OCS Fulltone can be spotted in there. 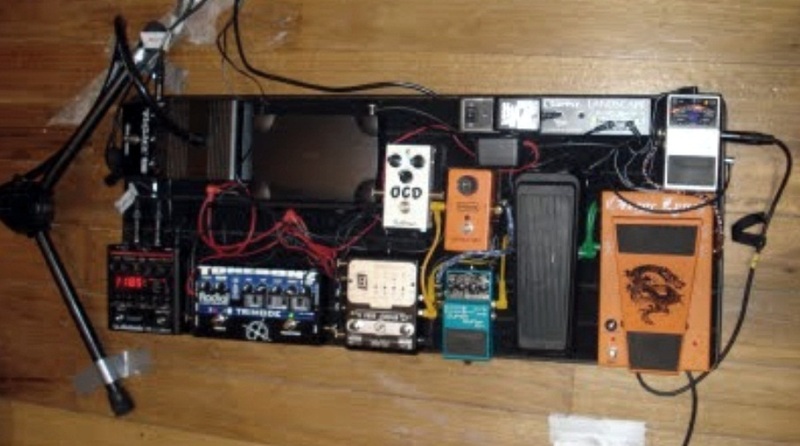 In this more recent picture of Jimmy's pedalboard, you can see his Fulltone OCD. En varias fotos de sus conciertos podemos ver el OCD de Fulltone en su pedalera. "TC Electronics Flashback Delay, OCD Overdrive and a TC Electronics Reverb pedal.?" he said he used these pedals for this video in this reply. "That goes into a Fulltone OCD and then a Boss OC-3 octave pedal." In a Twitter post made by Syu in September 17th of 2017, Syu's rig is shown where he uses a Marshall JCM 900 head and cabinet, as well as a Fulltone OCD Overdrive. At 13:39 of the YouTube video entitled "Hanno Busch Gitarrist (Heavytones)", the Fulltone OCD Obsessive Compulsive Drive Overdrive Pedal can be seen on Hanno Busch's live pedalboard. great over drive pedal, not much to say other than how good it sounds and mixes with the amp and guitar. Max Colbert's pedalboard features an OCD overdrive pedal. In this interview he mentions that he uses Fulltone OCD Obsessive Compulsive Drive. > The Electro 3 has a lot of great tremelo effects and phasers and a ring modulator. There is also sort of a rotary simulation so I use a bunch of the effects within the keyboard. And then from that I go into a **Fulltone OCD** which is essentially a drive pedal for guitar but it has the effect of a distortion pedal for the keyboard.> -Sanae Yamada at Positive Destruction (positivedestruction.wordpress.com) 14/11/2011. Fish uses minimal effects, but has a Fulltone OCD for when she’s playing smaller clubs and can’t crank her amp but needs gain distortion. This is the second pedal in his chain in his gear talk with RFC. In this picture taken during the concert at Sala Magna in Concepción we can see a lot of pedals and a couple of power supply units. Tour: Al despertar, 2017. Haruna relies on her OCD for her classic overdriven sound. What a great pedal. "In the studio, I just use my Fulltone OCD for most of my sound." 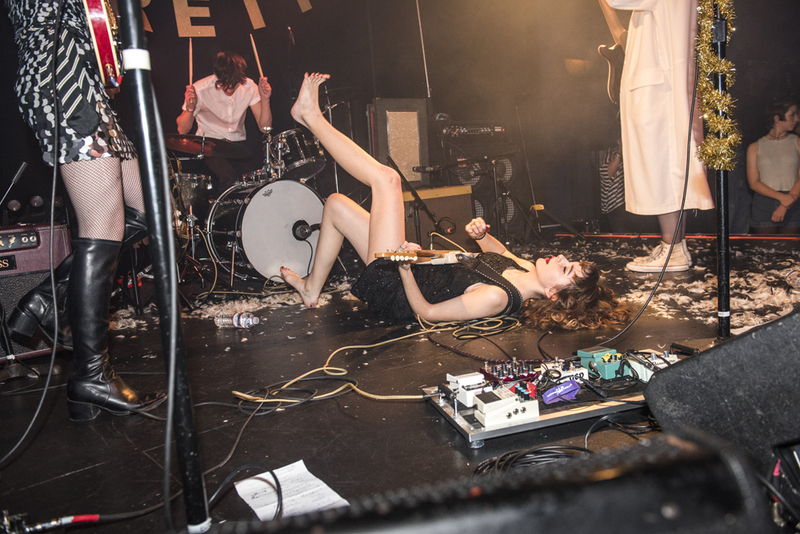 -Sophie Hopes states when talking about her effects pedals. Visible on Fender's pedalboard at 2:15 in the music video for his song "Leave Fast". As mentioned on Stuermer's official website. In this live photograph, Night's pedalboard with an OCD can be seen. At 2:58 in the Youtube video Finn's entire pedalboard is visible including his Fulltone OCD. On Fulltone's official website, Paul's artist page contains 3 pictures, one of which shows the OCD. At 4:00 in the video Zack's pedalboard is clearly visible. In this image, you can see a Fulltone OCD (1st white one). An overdive pedal that Domhnaill borrows off a pal for his solo on "Leche" and "Nachos Part 2". 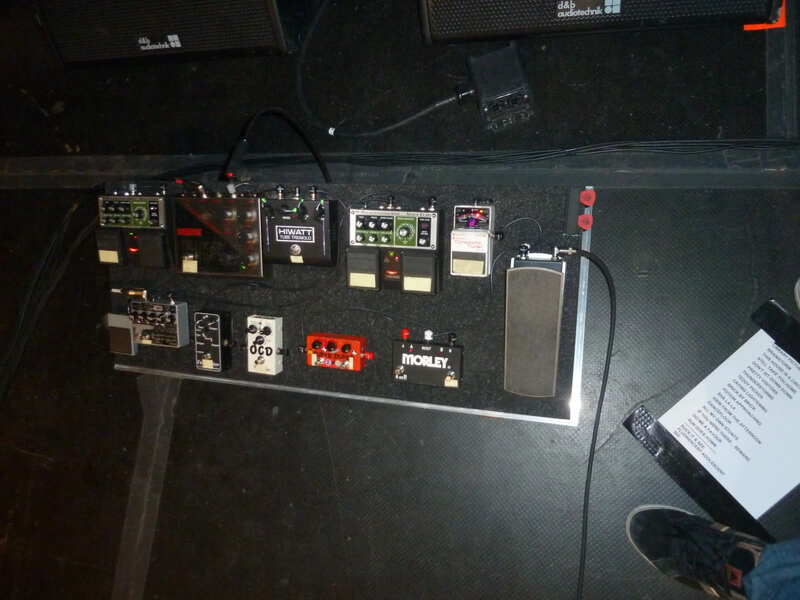 In the picture you can see the pedal on Sjors' pedalboard. This picture was taken of an Instagram story he posted in December 2018. Gina Gleason of Baroness can be seen with a Fulltone OCD on her current touring pedalboard. 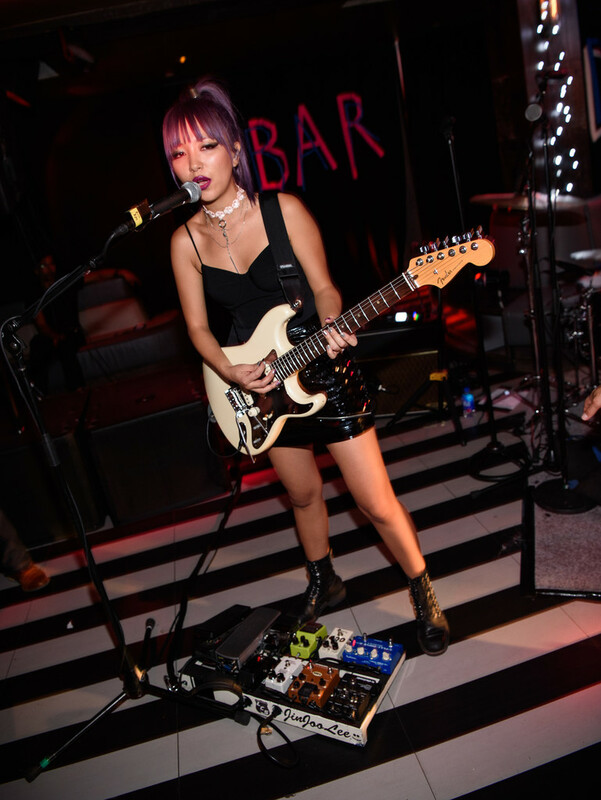 (Early 2019) Looks like she is using the Gig Rig G2 Switching system as well on her board. Luke Weiler of Positive Mental Trip has played a Fulltone OCD live since 2006. It was his only overdrive live until he added a J Rockett Audio Designs Archer Ikon to his live rig. Luke plays the older version of the OCD as there are no arrows around the knobs. It is said to be a version 1.1 or 1.2. The Fulltone OCD-Obsessive Compulsive Drive-overdrive pedal packs classic OD tones into a compact pedal with simple, no-fuss operation. From heavy crunch rich with overtones and feedback to spanky cleans, the OCD delivers the sounds of a great tube amp, as sell as the same sensitivity and response to your playing style. Along with standard Volume, Drive, and Tone controls, the OCD's HP/LP (High Peak/Low Peak) switch takes the pedal from a clean boost to manic, sustain-laden distortion. True bypass switching. Bought this bad boy here about 1,5 month ago and I gotta say, it hasn't disappointed me yet! It's got so many options for any sound you could possibly dream of! Not to mention the pristine hand craftsmanship that's been put into this pedal. I would definitely recommend this for any guitarist (and maybe bassists too?) out there. Awesome pedal! This pedal has a overdrive switch (low output) and a distortion switch (high output). With the low output switch, you can get a very good bluesy lead tone. But with the high output switch if you really crank it, the sound remains very tight without getting fuzzy. So it even sounds very good if you want to play metal or hard rock as well. Awesome, not particularly unique pedal. You'd have to be crazy not to want this diverse OD pedal on your pedalboard; the range of sounds it can achieve is incredible. This having been said, it may lose out to relative newcomers like the Black Arts Toneworks Black Forest, because it isn't necessarily that original: those looking for a signature tone may want to keep searching. Don't let me land on a sour note, though. This is a legendary pedal. ive been needing a ds/od pedal for a while now and i was thinking about getting a ts9 and i tried it at a friends house and it was just too mellow for me and i figured i could get a similar sound with a compression pedal. from the reviews and the videos this seems pretty awesome. Probably one of the most transparant overdrive/distortion pedals I've ever used. No matter how high you turn op the gain knob on this one, you'll keep all the clarity and definition in your playing. Lovely pedal! This distortion is a perfectly rounded pedal for almost any use. Whether you want to use it as a solo driver or just to dirty up your tone, this pedal can do it all. Very reliable and easy to figure out. Lots of possibilities. Highly Recommend. My low gain drive to "roar"
This one i use to get low gain drive sounds with a roar texture. Sorry, i cannot say to much things despite of its beatiful sound, and dynamic behavior. I just like it too much, but at same time, still looking around for other, to confirm its quality or even chage it some day. I must try j.Rockett Blue Note/Animal and Red Jasper too. I prefered it over Catalinbread DLS MKIII by far. the other pedals you mentioned are totally different than an OCD. They are more like well-tuned fuzz pedals that produce an OD/distortion sound because of component selection and careful voicing. The OCD is a very well-refined diode-clipping distortion in the mxr distortion+ camp. Its dynamic behavior compared to a 70s design comes from the clipping diodes being connected to the bias point of the op amp that amplifies your signal, so the amount of clipping and behavior of the clipping is really controlled by how hard you pick. Its a great idea, but sadly not Mike Fuller's like he claims. He lifted the clipping scheme from a discontinued Vooodoo Lab overdrive. The Catalinbread DLS (for instance) is based on the General Guitar Gadgets Brown SOund in a Box kit. Nick makes no bones about the source of his awesome design. The DLS uses 2 Jack Oram designed jfet miniboosters as building blocks to simulate that cool odd-order harmonic content churned out by a vintage plexi front marshall. The minibooster uses a pair of small jfets in push-pull to amplify your signal in a non-linear fashion that makes the jfets even ore tubey than they are used singly in class A. Nick at CB did a great job refining the original BSIAB over the years. All of his foundation drives are VERY impressive. Nice! Cool informations! it's very helpful know about the "inside"and how the circuit works. For a while i feel just the sound and try put on words my sensations. Considering what you said, i won't find a best overdrive pedal to my needs, because is just the "dynamic behavior" of OCD, what i most like on it. Did you try or hear the Red Jasper? Well I was using a VOX ICE 9 overdrive pedal for about 4 years of my guitar playing life and managed to not hear that it sounded a little weird at times. It was always missing something tone wise and sounded sort of empty. This OCD replaced it quite well. It can be a simple crunch clean boost or it can be a loud and heavy sounding distortion. Has moderate sustain and excellent tone. Well reputable and a classic pedal. What's not to like!? The OCD has that magically something. It's generic enough to work with any genre, but special enough to turn heads while doing it. I use it with the drive almost full off as an overdrive into a Vox AC15. It brings you over the top without a disconnect between your clean and dirty sounds. It highlights the sounds already there. It goes to full mental when you turn the drive up. If I could have only one pedal it would be a Tumnus, but I would be wishing I picked the OCD much of the time. It's a great pedal for those fat, saturated fuzzface type tones as well as a medium to high gain Marshall type. Sounds like a cranked up Marshall. The range between de od and a distortion makes it very versatil. I've had this on my board for a few years. It's extremely versatile for anything from fat smooth overdrive, classic rock distortion to fairly high gain lead sound. The HP LP switch definitely is really usable in both settings, HP for a more modern distortion kind of EQ, LP for a slightly more vintage drive tone (to my ears). The fact you can power it with a battery, or then feed it anything from 9 to 18v makes it both convenient and allows you to further customize your sound with voltage. It's been reliable and fully functional for me for years traveling to hundreds of practices and gigs. In my opinion it doesn't really do the super low drive barely broken up clean OD that well, I have other pedals for that. The OCD reacts so well to your picking, a soft attack yields a wonderful clean sound, then go a bit harder and the dirty comes in. Also keeps your guitar sound like it should, you're playing a Strat, it sounds like a Strat, a Les Paul, it's a Les Paul. its actually a very refined voodoo lab overdrive, not the sparkle drive, but the odler overdrive that's discontinued. That circuit is basically a Rat with a very important difference, the back to back clipping diodes don't shunt to ground, they shunt to the 1st opamp stage's bias potential making the clipping threshold variable based on your playing... fuller stole this great idea and refined the tone control, voicing and switched the stock diodes 2 diode-wired mosfets with an extra germanium diode on one side (ala boss' DS1) to wring maximum amplike response from an already good circuit. Which is why eh makes the big bucks even though he never invents anything himself. Thanks for the Jimmarchi1 - good to know the story behind the pedal. Oops, left out a word, sorry. Should be: Thanks for the information Jimmarchi1 - good to know the story behind the pedal. Monstruous pedal, very tranparent, conserves beautifully your clean sound while on usage. Carlos, do you hear me? I have both the OCD and the Wampler Ecstasy on my pedal board. When I want high-intensity OD or want to get to that overdriven legato/continuous stream of notage territory, I hit this one ... or even hit them both. The Wampler seems to add a bit of bottom, but the heavy drive is coming from the OCD. the OCD is a decent overdrive, right in the middle, and easy to dial in a tone you like. And it compliments a lot of pedals like the big muff. Very versatile stompbox. Can get a good blues breakup with the LP channel and the gain turned down, or crank up the gain and get a really cool Vintage distorted tone. It's a great pedal for enriching tone and presence. My little baby! Não troco esse pedal. Nervoso e gentil, ao mesmo tempo! This is one incredible overdrive as it adapt to the way you play (if you're playing with a hard picking technique you'll have more drive). And it can be use with just a bit of drive. It"s a must have for any guitarist. I love this pedal! I This was my first Fulltone pedal and I've really fallen in love with Fulltone since. This pedal is so versatile and sounds amazing! It's extremely amp like. The LP/HP pedal is what really makes a huge difference. The HP setting really enhances the mids and the LP setting is much more flat. Through years of tinkering, I've never found another pedal that more perfectly hit the mark of the lead tone I was searching for. Natural, just the right amount of compression, seems to play nice with different guitars and amps. This is a must pedal for the Fender Princeton Reverb Reissue – or any tube amp that doesn't have an dirty channel. The sound is natural and will not piss off your neighbors. The only downside so far is that it doesn't seem to place nice with other OD or distortion pedals. The MXR Distortion+ seems balance it out the best.